In order to start the discussion around the use of UBL to communicate to an outsourced warehouse I would like to start discussing the process flow around ReceiptAdvice. 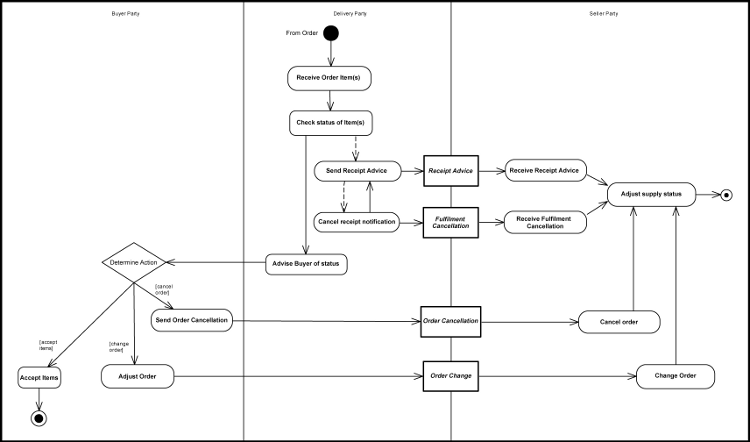 In particular I would like to start the discussion around the following process flow as is currently in the UBL 2.1 documentation. In the following discussion I treat the DeliveryParty as the outsourced Warehousing party. Where has been defined that the DeliveryParty should receive the “Order” and who is sending it to the Deliveryparty? In the ordering process the DeliveryParty is not mentioned in the process flows. Also you can argue that the DeliveryParty should not receive the actual order, but a “stripped down” version with enough information in order to receive the goods (so no financial information). So I would propose a process where the BuyerParty is sending a UBL document to the DeliveryParty with these details. And this UBL Document could be called a “ReceiptOrder”. This would be an order from the BuyerParty to DeliveryParty instructing them to receive goods, performs some checks etc etc. So for this communication stream we should define a UBL document. In my view this could be the actual ReceiptAdvice it self, but then from the DeliveryParty to the BuyerParty. But that would also have impact on the communication as defined in this process between the DeliveryParty and the SellerParty. I hope this is enough to start a discussion around these flows and the place an outsource warehouse with the whole communication chain.